The Tag Cloud gives you data at a tag level. See valuable data like Share of Voice, Analytics data and more for your tags. To see in-depth data such as Share of Voice and analytics data, a subscription including 1000+ keywords is required. To learn more about prices and features, visit our pricing page. 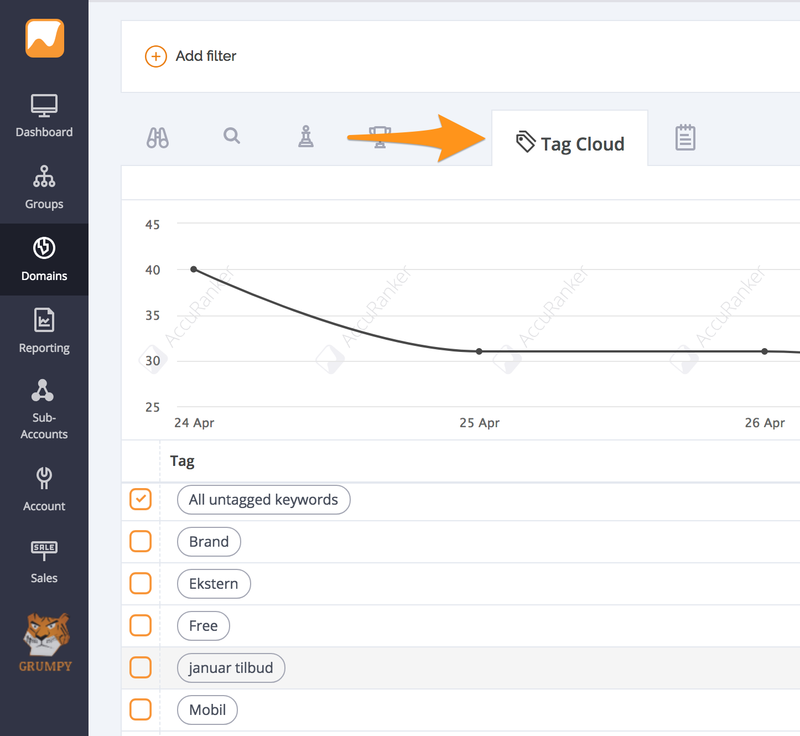 Important note: Using the Tag Cloud requires that you're already using tags to categorize your keywords, you can click here for our guide on how to create tags. Google Analytics integration is also recommended for the best experience. To access the Tag Cloud, simply go into the respective domain and select the Tag Cloud tab. Now that you're in the Tag Cloud, lets go through the columns and the data they provide, shall we? Tag shows you a list of all your tags. All keywords that are untagged will belong to the "All untagged keywords". The Keywords column shows the amount of keywords in AccuRanker, that have that specific tag attached to them. Keywords that have several tags, will counts towards all tags keyword count. Search Volume is the combined monthly Search Volume of the keywords marked with the tag. SoV is a shortcut for Share of Voice, and shows the Share of Voice for the keywords marked with each tag. Combined CPC for all keywords at each tag, hover your mouse over the amount to get the average number. Average time spent on the URLs the keywords in each tag point towards. Similarly, average load time is the average loading time of the URLs that each keyword in the tag point at. How many times a URL has fulfilled a Goal in Analytics. Goals are up to you to define in Analytics. Here we are looking at the URLs each tagged keyword is pointing at. How much revenue each Tag has generated, fear not if says 0$ as Google Analytics often attributes the revenue to your checkout URL.